Carl Sutton & Cheryl Forrester of iSpeak. Foreword by Donna Williams. Cover art by Kimberly Gerry-Tucker. An eye-opening and enlightening collection of stories from people living with Selective Mutism (SM), this book provides a much-needed platform for people with SM to share experiences of the condition in their own words. Exploring all aspects of SM, from symptoms and diagnostic criteria, to triggers and the consequences of being psychologically unable to speak, the stories in this book dispel the myths around this often misunderstood condition. Far from refusing to talk, or choosing not to, the contributors offer genuine insights into why they simply cannot speak in certain situations or in front of certain people. Children, teens and adults from the UK and US share experiences of feeling isolated, struggling at school, and finding ways to communicate. Letting people with SM know that they are not alone with the condition, the book will also help family, friends and professionals to understand what it is like to live with SM. 1. An experiential introduction to Selective Mutism. 2. Selective Mutism - what it is in our own words. 3. Early life and Selective Mutism. 4. Early school experience and Selective Mutism. 5. High school experience and Selective Mutism. 6. Parents' experiences of high school and home-schooling. 7. Becoming an adult with Selective Mutism. 8. Bullying and Selective Mutism. 9. Mutism, family relationships, and the home environment. 10. Those who spoke for me. 11. Selective Mutism and Asperger Syndrome. 12. Selective Mutism and Learning Difficulties. 13. Parents' experiences of Selective Mutism. 14. Therapists' experiences of Selective Mutism. 15. A teacher's experience of helping a child with Selective Mutism to find her voice. 16. How different life would have been without Selective Mutism. Appendix A: Helping a new partner join a family where there is a child with Selective Mutism. Appendix B: The reasons why I dislike school. Finally a book to dispel the myth that SM is an exclusively childhood condition. My greatest hope is that this valuable contribution to the field will not only improve understanding of the nature and far-reaching effects of SM, but help mobilise Health Services to provide appropriate support for both children and adults. Maggie Johnson, FRCSLT, Joint author of the Selective Mutism Resource Manual and Can I Tell You About Selective Mutism? This must-read book educates about the emotional challenges of Selective Mutism experienced by all involved. From being bullied to overcoming obstacles, Sutton and Forrester expertly weave heartbreaking and uplifting moments through personal stories that read like journal entries. This is a resource that should be on all clinician’s shelves. A fascinating and beautiful glance into the lives of individuals with Selective Mutism and those who love and support them. A wonderful book that is certain to shed new light on the inner lives of those with Selective Mutism. Selective Mutism (SM) is a situational anxiety disorder which generally begins in early childhood but which can sometimes continue unabated into adult life. A child or adult with SM cannot speak in certain situations due to fears of initiating speech / being overheard. Children with SM may find themselves unable to speak for the entirety of their school lives. In some instances the school environment can cause so much stress for a child that they require home schooling. In adolescence and adulthood the repercussions of SM can be depression and other anxiety disorders (e.g. Agoraphobia, Social Anxiety Disorder, and Generalised Anxiety Disorder); severe social isolation; difficulty finding or maintaining employment; difficulty attaining romantic relationships; and so on. As someone with a long experience of SM myself, I did not feel that there were sufficient first-hand experiences of Selective Mutism in published literature and so I created this book, Selective Mutism In Our Own Words, to bring lived experience of this anxiety disorder - including my own experience - into the public domain. The book looks at the experience of SM in all age groups - from early childhood all the way to adulthood. 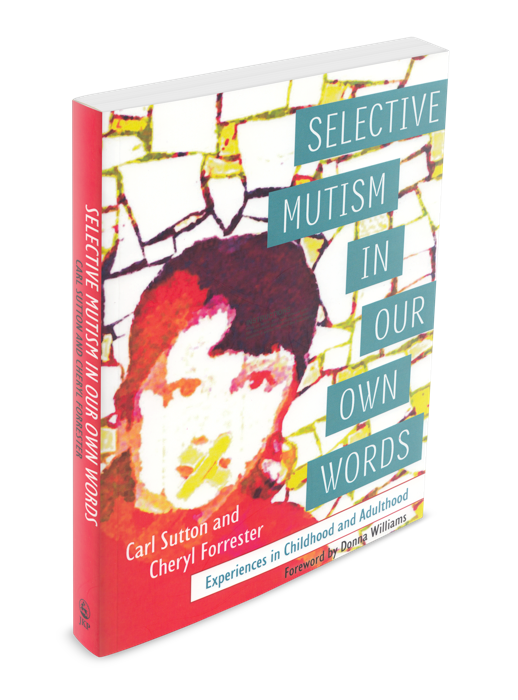 It contains the lived experiences of around 40 people from the US and UK who write about Selective Mutism in their own words. Also included are candid first-hand accounts of living with a dual diagnosis of Selective Mutism and an Autism Spectrum Disorder and parents', therapists' and a teacher's perspectives of this condition. Carl Sutton and Cheryl Forrester run iSpeak. Carl both has personal experience of Selective Mutism and also carried out academic research into Selective Mutism at the University of Chester, UK. Cheryl is a qualified social worker, person-centred counsellor, and nurse. They live in North Wales, UK. The foreword to the book was written by Donna Williams, best-selling autism author.